Amidst all the excitement about next generation rooftop solar solutions, too little attention is being paid to what should be an obvious fact: the energy-saving potential of the solar solution on top is entirely negated if the roofing substrate below it fails. Rubber grommets deteriorate rapidly from the effects of weather and UV rays, allowing water to penetrate into the roof system below. A well constructed rooftop solar system can be expected to generate alternative energy for 30 years or longer, producing as much as 80 percent of its original capacity a full 25 years after its installation. Fact Two: The average life expectancy of today's commercial low-slope roof is only 17.5 years, with as many as 15 percent of roofs failing in their first six years1. Clearly, there is something wrong with this picture. With solar energy so recently and quickly gaining such a high place on the national agenda, system integrators new to the game do not always realize that installing solar panels, without performing due diligence on the underlying roof, may cause serious service disruptions that totally negate any energy-related savings. The typical solar integrator is not a roofing expert, as evidenced by the inappropriate attachment details we have seen in the field. Even a sound metal roof cannot be expected to maintain watertight protection with fasteners attached to it, protected only by rubberized grommets (see photo). A roofing professional knows that rubberized grommets will dry out and crack long before the solar panels cease producing energy. Similarly, we have seen mastics, such as a flashing adhesive, spread over a screw that attaches the solar panel racking system to either a metal or modified bitumen roof. 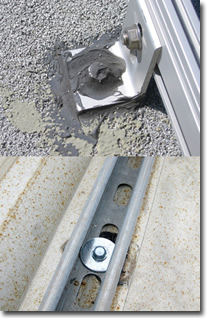 This inexpensive maintenance item was never intended to seal off a direct and deep penetration into a roof's surface. In cases such as these, the service life of even a newly installed 30-year commercial roof will be severely curtailed, precipitating costly disruptions in energy generation. In addition, the owner is confronted with the unanticipated expense and disruption related to premature tear-off and reroofing, as well as possible damage to the solar panels, which should be handled as infrequently as possible. For every opportunity presented by rooftop solar, there is an accompanying risk. Realizing the full potential of this technology will take creative collaborations wherein owners and their design representatives work collaboratively with knowledgeable roofing professionals and competent solar system integrators to ensure the short-term and long-term viability of rooftop solar solutions. Fortunately, partnerships between solar integrators and roofing material manufacturers are becoming more common and represent an ideal solution for ensuring that all roof-related factors are addressed from the beginning. If you are considering implementing a rooftop solar solution, it is essential that the concerns reviewed below are thoughtfully considered and accounted for, prior to installation. 1From a 2009 presentation, "The State of the Small Business Economy and Identifying Policies to Promote an Economic Recovery," presented by the National Roofing Contractors Association president to the House Committee on Small Business, quoting a study by Ducker Worldwide, a leading industrial research firm. How sound is the roof and its underlying deck? Given the anticipated service life of a typical solar system, best practice dictates that rooftop solar arrays should be installed only on roofs that can be expected to maintain their waterproofing integrity for at least 30 years from the time of solar installation. Further, if you want to optimize your chances for lasting success, it is reasonable to demand a flood test (a test in which the roof surface is deliberately flooded with water to ensure watertight performance). It is better to identify and repair a roofing problem before the rooftop solar is installed. If the roof is recent, but not newly installed, a thorough inspection should be implemented, including infrared scans and a careful review of the deck condition at the time of installation. Since rooftop solar systems add as much as four pounds of weight per square foot of roof, a structural load analysis should also be performed. Who stands behind the roof's performance? Warranties are written to protect manufacturers, not customers. Never assume that the "warranteed life" of your roof will be the actual life of your roof. The financial stability of the manufacturer, and their track record for honoring warranty claims, are facts that are easy to verify. Check them, and if you are not happy with what you find, remember: it is far less costly and disruptive to tear-off and reroof prior to a solar array installation. What kind of roof is best suited for solar installations? The only fair answer to this question is: the roof that outlives the solar array you are installing. History has shown that high-performance standing seam roofs and BUR roofs using multiple plies of protection routinely exceed the 17.5 year life cycle of the typical commercial roof. Are the solar installation methods being considered compatible with your roof? Utilizing innovative attachment systems, such as this S-5! 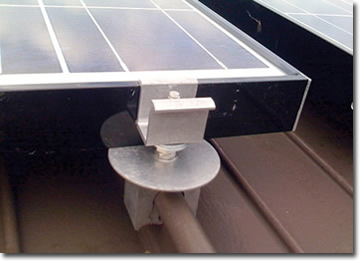 clamp, is one effective method of minimizing penetrations when installing rooftop solar solutions. From a roofing manufacturer's perspective, the fewer penetrations to the roof, the better. Therefore, ballasted solar systems, which typically require minimal or no penetrations, are generally preferred. But it's not always that simple. For example, a ballasted system may not offer the wind uplift profile required for a particular building and geography. For standing seam metal roofs, the integrator might consider using clamps as an alternative to screws for attachment. S-5! clamp systems are growing in popularity, and they provide a less intrusive method of attachment, while maintaining a high level of wind uplift resistance. They clamp over the top of the seam, using a set screw that tightens like a clamp instead of penetrating the metal (see accompanying photo). However, in states where seismic or wind considerations pose severe vibration or wind-related hazards, additional engineering and installation requirements are necessarily more stringent. Installers may have no choice but to use a penetrating installation method. This is one more situation in which collaboration with a roofing professional is indispensable to a successful outcome. Over the years, the roofing industry has devised a number of creative attachment methods, such as routing screws through piping, which enable effective penetrations without sacrificing waterproofing integrity. Only a thorough evaluation of all factors, including manufacturer warranty considerations, can determine which approach is best for a particular application. Will Solar Array Installation Void Your Rooftop Warranty? This is probably the single most critical factor to be considered, if you want to avoid finger pointing in the event of failure. Virtually all manufacturers of quality commercial roofing materials will provide, upon request, the proper details to ensure appropriate installation of rooftop attachments. Similarly, most roof manufacturer warranties are voided if you fail to follow the manufacturer's written guidelines. Chances are more than good that allowing a contractor to install a solar array without prior consultation and collaboration with your roof manufacturer will void your warranty. Even with non-penetrating solar installations, there may well be language in your roof warranty that will void coverage. For example, some manufacturers may require a walk pad, rather than allowing a ballasted racking system to sit directly on top of the roof. Even though such racks are carefully weighted, over the course of 30 years it is reasonable to assume some abrasion may occur. Without a walk pad serving as a kind of sacrificial layer between the roof and the racking system, the roof's performance may suffer over time. By failing to consult your roof manufacturer, it is likely that all costs of roof replacement and solar array removal will be borne by the owner, should a failure occur. With the rapid growth of the solar industry, it is understandable, but nevertheless unfortunate, that solar installers are not always knowledgeable about the effects their installations may have on the underlying roofs. If you are considering a rooftop solar solution, it is worthwhile to work collaboratively with professionals who understand not only the energy-saving potential of solar arrays, but also the fundamental requirements of sound roofing practice. Working with organizations that provide both skill sets under a single, accountable warranty is your best guarantee of success. Brian Lambert has been active in industry initiatives promoting green roofing and other sustainable design solutions since 1996. He was a founding member of the Toronto-based Green Roofs for Healthy Cities Coalition and frequently promotes sustainable design as a guest lecturer to professional organizations in the U.S. and Canada. Lambert is general manager of Garland Energy Systems, Inc., (www.garlandenergy.com) a fully owned subsidiary of Garland Industries, which is dedicated to making alternative energy solutions as easy to purchase, install, and maintain as utility electricity. Garland has been manufacturing and distributing high-performance solutions for the total building envelope since 1895.